Diabetes is not a joke. Diabetes kills. Diabetes is not a joke. Diabetes is not about weight or junk food. This disease requires those living with it to walk a fine line…too much or too little insulin can have catastrophic ramifications. The fear is real and justified. Diabetes kills. The article below was originally published on May 11, 2016. It was exceptionally hard to write. As a parent of a child with diabetes, we know that diabetes is deadly but we hope it will never kill one of our own. When it does….well your world is shaken to the core and is never the same again. I think of this family daily. I can only begin to imagine their pain and the pain of others who have also lost their loved ones to this disease. We will never forget. We will continue to work towards a cure. 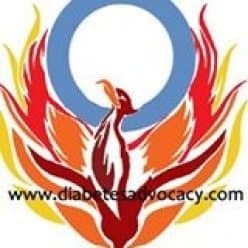 In the diabetes online community, the appearance of a blue candle suggests that someone has lost their life to diabetes. Its a time of sorrow and a time during which we hug our loved ones a little closer. It is also a time to test a little more often before we allow the memory to fade and we move on. Last week I received a message that made my heart stop. I headed over to a friend’s Facebook page to verify what I had read. There was the blue candle. That’s what I replied through the tears. I was numb. The blue candle was no longer for a stranger who could have been my child. This candle was for a child that I had watched grow through our online communications. This was happening to a friend who had been there for me through highs and lows of 16 years with diabetes. I wished I could bring her son back to her. The pain was too much for me and I couldn’t begin to imagine how she was feeling. It hurt too much to try. No mother should bury their child. We shouldn’t have to mourn for those who have yet to have fully enjoyed their lives. There is something fundamentally wrong with that. It makes our hearts ache. When we hear of a child lost, we hurt but we push it away. It happens to other people. It is horrible but it happens to other people. But what about when it doesn’t? What about when it hits your family? Last week it hit my family and the pain is still fresh. 15 +years ago, I became connected to the internet. I reached out to find “parents of children with diabetes”. Instead I found an information email list, or so I thought but what I really found was a family. I found people, some that I would meet, some that I would talk to on the phone, and some that I would never know beyond the keystrokes of a keyboard. All of them would become family. They would be by my side through the good times and the bad. They would understand diabetes –its peaks and valleys but they would also understand me. This incredible online community would be there for me at all hours from around the globe. They were Friends for Life–they were family. Over the years, some of those connections have been neglected. Our children have grown and some of our children have become parents themselves. We have watched each other’s lives on Facebook and occasionally we wish each other well. Other connections remain strong. We reach out regularly. We have remained in contact and fondly look back on where we have been. No matter whether we are close or drifted, when tragedy strikes we are all one big family again. One family united by pain–sobbing with each other. A family holding each other in virtual hugs through real tears. Tragedy isn’t supposed to hit us. Not a direct hit like this one. Diabetes in to supposed to take a child that we “knew” and watched grow but it has. The pain is unbearable. I know that the pain will fade for some of us. It will dull a little for my friend but that missing piece will never be replaced. I am lucky. In 16 years, my son has stayed quite healthy. In all of this time, I have only known of one person–whom I had met, spoken with, and been friends with, who had died because of diabetes but now there are two. Those are two too many. Those of us in the diabetes community will continue to work harder. Some people will bike more while others will walk more. We will all advocate louder. We came together because of diabetes but we have stayed together because of incredible friendships that knows no borders. I pray that one day we will celebrate a life without diabetes. Until then, hug your loved one a little closer today. Send prayers and strength to the families who have lost someone during our fight. I am grateful to each of you who have become such an important part of my life.